Today we are featuring a one of kind customised motorycle 4 horizontally placed suspension with a very old school look. This is Moksha. It is build by Wheel Vedas Customs. This motorcycle has no cables visible its all neatly hidden it's a twist know starter system. They have done it artistically keeping the naked chassis in mind with leather and brass touch to it. The engine is a rebuilt Thunderbird old 350cc which they managed to convert it into 535 cc . The motorcycle has no twist acceleration like the normal bikes it is old school brass lever on the right, so for acceleration you need to apply levers like brake but inspite of stoping it will accelerate. The starter is a brass circular knob you need to simply twist it the bike starts automatically. The tank is hand crafted and hand painted. The seats have a hand crafted designed leather wrapped touch . The engine shells covers are acid washed and then etch based art is displayed (hand made by me) .The tail lamp is a perfume bottle used cos no tail lamp were fancying me so made my own with a perfume bottle a 212 bottle. On discussion with J Shetty, Owner of Wheel Vedas Customs, he said - "Moksha was offered above 25 lakhs after the red bull interview in which I had mentioned we would never sell the bike the buyer wants to be name less and he agreed to bare the shipping cost to his country that's was the achievement for us and the start of WHEEL VEDAS CUSTOMS journey. 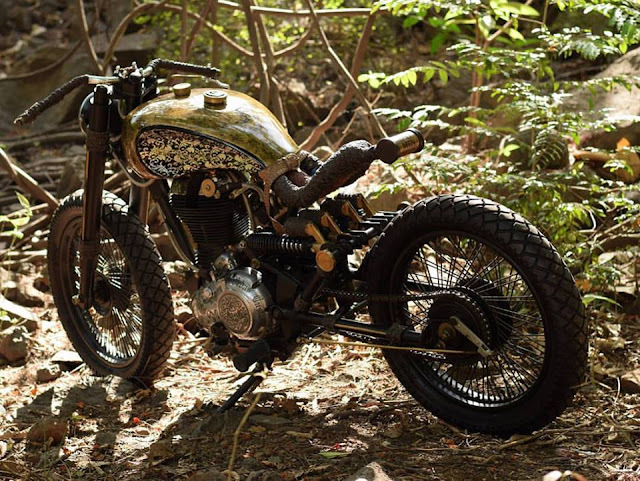 Moksha is my first solo planned, designed, painted and executed motorcycle."